You are here: Home / Misc. / Book Club/Book Reviews / Book Review; Fashioning Us in the World’s Image – Prosperity Preaching. Book Review; Fashioning Us in the World’s Image – Prosperity Preaching. On March 14, 2012 on ThyBlackMan.com, Dell Gines wrote that post modern, materialistic hedonism is one of the most destructive things for the Black community. “Our value system is now based on the pursuit of pleasure or the pursuit of things that we perceive will provide us with pleasure over the contentment gained by building supportive relationships with others, developing a thriving and nurturing community, and an aiming to secure a better future for the next generation.” Truer words have seldom been written. One of the even sadder realities of this materialistic hedonism is that some of its sources are black churches. Prosperity preachers teach their people that God promises them material wealth. They tell them to have faith in God so they can get more money. When they get more money they can get more stuff – more expensive stuff. When they have more expensive stuff, they better reflect Jesus who died not only for their sins but to also give them financial victory so they can get more stuff. (We won’t address here the fact that Jesus was poor and offered serious critique about the acquisition of wealth in his day). In prosperity theology, our sovereign God, the creator and sustainer of heaven and earth and everything that dwells therein, is morphed into a divine genie who exists solely to fulfill our hedonistic desires. One of the problems with prosperity gospel is that it distorts God and the gifts of God such as faith and hope by fashioning them in our materialistic image rather than requiring us to better reflect God’s image – to reach higher, try harder to become more like God. In prosperity preaching, Christians are taught that their paychecks are not meant to support the standard of living God wants for God’s people. Rather, paychecks are to be used as “seed” to be sown for God to return to them multifold. Based on this teaching, some people assume debt they cannot afford while praying for God to “make a way out of no way” on their behalf. Even though God does bless our income when we give freely through tithes and offerings, we should not dig ourselves into a financial ditch – buying new clothes, shoes, purses, jewelry, suits, cars and hats we can’t afford – and then asking God to multiply our money so we can pay the bills. Is this not tempting God? When Jesus was fasting in the wilderness (Matt 4:7) Satan tried to provoke him to throw himself off of the pinnacle of the temple believing that angels would be there to pick him up. Jesus stated, “It is written, thou shalt not tempt the Lord thy God.” It is one thing to ask God to help us when we cannot help ourselves. It’s a whole “nother” thing to intentionally create “top of the pinnacle” situations in which we jump and expect God to save us. Prosperity preachers get their messages by proof-texting (taking one verse in a chapter of the bible, ignoring what comes before and after it, and claiming that the verse is a promise of God for all people – for all time). Black people should be the last people on earth to ever tolerate proof-texting – even when the news seems to be good. After all, slave masters used proof-texting to justify the institution of slavery in this country. Dell Gines’ admonishment for black people to stop focusing on hedonistic materialism and to instead be content building supportive relationships with others, developing a thriving and nurturing community, and an aiming to secure a better future for the next generation is good advice for black people both inside and outside of the church. Debra J. Mumford is the Frank H. Caldwell Associate Professor of Homiletics and the Associate Dean of Student Academic Affairs at the Louisville Presbyterian Theological Seminary in Louisville, Kentucky. 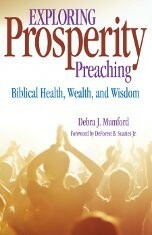 More information about the book and the author can be found at http://www.exploringprosperitypreaching.com. Thank you. Well reasoned and much needed.